A Jordanian member of the UN observer team in Syria says, that some of his teammates are carrying out spy missions by collecting information about Syria’s military headquarters. The Jordanian officer, who was not named in the report, was quoted by the Lebanese al-Diyar newspaper as saying that the Western members of the team, and in particular head of the UN mission in Syria, Major General Robert Mood, conduct acts of espionage against the Syrian government. He said the monitors, on the order of Mood, made a visit to the port city of Tartus that hosts a Russian naval base and is of high military and security importance and sensitivity. The UN monitors also visited four military zones in cities including Daraa, Homs and Idlib where Syria’s air and defensive air army are located. The Jordanian officer added that the UN monitors also took videos from an aerial reconnaissance base in al-Hareh and another military base between Nowi and al Sheikh al Meskin. 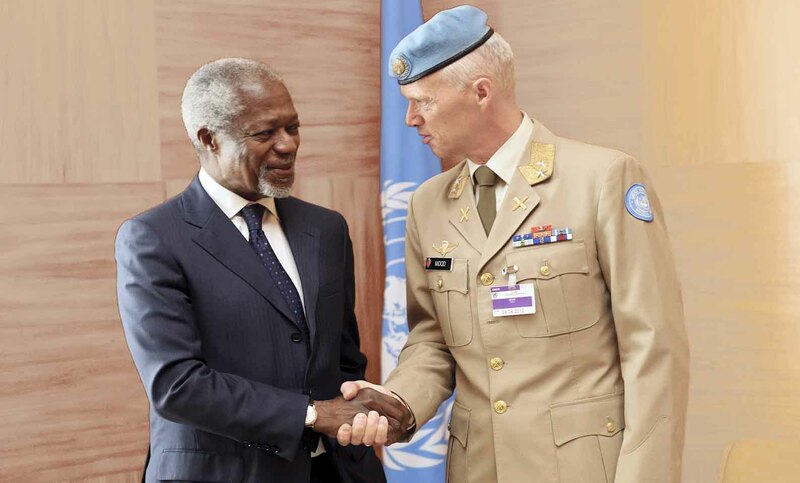 UN monitors are tasked with observing the implementation of a ceasefire that was part of UN-Arab League envoy Kofi Annan’s peace plan, but some of their activities and especially the visit to Tartus raise suspicions as this city has not been affected by the tensions and unrest in the country. 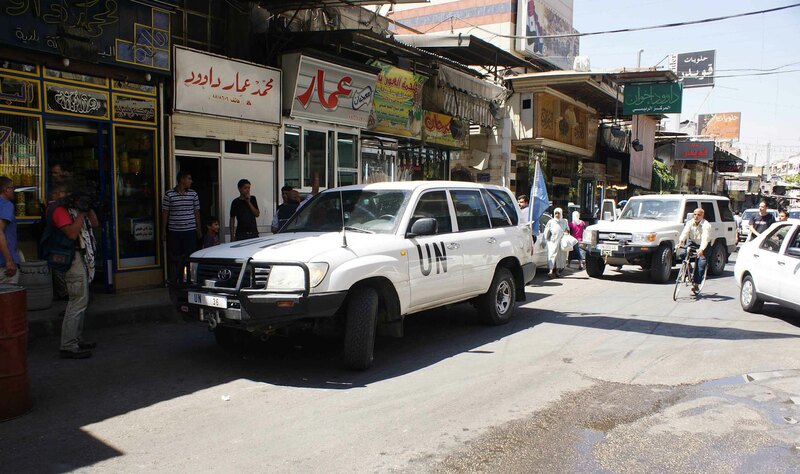 The first group of the UN observers arrived in Damascus on April 15. The observers were approved for the mission according to UNSC Resolution 2042 passed on April 14. On April 21, the UN Security Council met and unanimously voted on Resolution 2043 to send a mission of 300 observers to Syria. A UN observers’ car on June 12 injured three residents in Lattakia countryside while they were trying to explain their suffering due to the acts of armed terrorist groups. The civilians are Amer Mohammad Zamzam, Mustafa Hikmat Kamel and Issam Ma’rouf Mahmoud. Mustafa Kamel said that he was among the people who gathered at a point between the al-Sheer and Set-Kheiris villages on the Lattakia-Aleppo highway, when members of the UN delegation refused to listen to the citizens’ demands and kept on moving through the gathered crowd, causing several bruises to Kamel’s body and creating an panic among the people. Amer Zamzam said that the UN observers rejected talking to the people and drove their car abruptly and carelessly, injuring him in the leg and causing another car to turn over. The doctor who supervised the treatment of the injured citizens, Anas Adel Raad, said that the injured showed clear marks of abrasions, bruises and a stretching of hamstring and ankle muscles. The claims have appeared in Syrian state media, indicating that security circles have signaled their consent to publication in Damascus. It seems all the prisoners from a German operation are German citizens, including foreign-born German citizens. All are employed by a German private security company based in Stuttgart. The Germans were deployed to Libya five months ago and captured north of the Syrian port of Tartus around two weeks ago. They were offloading weapons and ammunition from a commercial vessel waiting in international waters using two speed boats. Syrian analysts are convinced that the German government did not pursue this operation on its own, but was acting on behalf of Washington.